Group by clause is used to group a selected set of rows into a set of summary rows by the values of one or more columns or expressions. It is always used in conjunction with one or more aggregate functions. I want an sql query, which gives total salaries paid by City. The output should be as shown below. 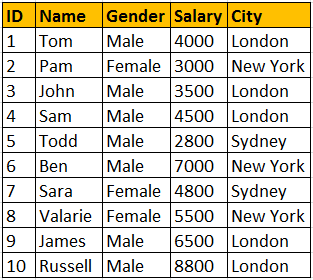 We are applying SUM() aggregate function on Salary column, and grouping by city column. This effectively adds, all salaries of employees with in the same city. Note: If you omit, the group by clause and try to execute the query, you get an error - Column 'tblEmployee.City' is invalid in the select list because it is not contained in either an aggregate function or the GROUP BY clause. Now, I want an sql query, which gives total salaries by City, by gender. The output should be as shown below. Query for retrieving total salaries by city and by gender: It's possible to group by multiple columns. 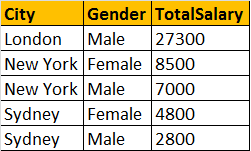 In this query, we are grouping first by city and then by gender. Now, I want an sql query, which gives total salaries and total number of employees by City, and by gender. The output should be as shown below. Query for retrieving total salaries and total number of employees by City, and by gender: The only difference here is that, we are using Count() aggregate function. WHERE clause is used to filter rows before aggregation, where as HAVING clause is used to filter groups after aggregations. The following 2 queries produce the same result. you wouldn't need, as early as possible. 1. WHERE clause can be used with - Select, Insert, and Update statements, where as HAVING clause can only be used with the Select statement. 2. WHERE filters rows before aggregation (GROUPING), where as, HAVING filters groups, after the aggregations are performed. 3. Aggregate functions cannot be used in the WHERE clause, unless it is in a sub query contained in a HAVING clause, whereas, aggregate functions can be used in Having clause. I would like to extent my sincere thanks to you. but, can I get the data dictionary of every table? I got a little confuse about tblEmployee. Where can I find the design of the table? I am a junior C#, ASP.NET and SQL server learner at the moment and I have been purchasing books the past few months to lean these subjects. However, the books have not really helped to explain clearly as you do. You are extremely good ! Your videos and slides are making my dream clearer. Thank you and please continue the good JOB !! I am learning SQL for the couple of months. I have seen a lot of materials but yours is the best. Even though I don't know u in person, u earned a lot of respect from me. providing this quality material for free is really amazing. u are changing the life of many people including mine in a good way . THANK SO VERY MUCH FOR POSTING ALL YOUR VIDEOS AND FOR DOING SUCH AN EXCELLENT JOB EXPLAINING THE CONCEPTS. YOU ARE TRULY AMAZING!!! -- GOD BLESS YOU! thank u for such a beneficial, valuable videos ..... its very easy to learn for the biggner with the help of these tutorials . believe me or not i started coding in .net after seeing your videos. My husband got impressed. I really like to pay something once i get the job. I seen the link to amazon but could you have one more button for donation to some NGO or something like that... I am sure many people like to do that after watching your noble task of contributing to society. it is really related too the real working environment. Thank You SO much Venkat sir. Your videos provides perfect guidelines and knowledge . Thanks so much for putting so much effort into it, there could not have been more clear and brief explanation of such concepts.